It seems like the nicer, warmer weather has come and gone in the UK, replaced by downpours aplenty. However, increased ambient temperatures during the summer time bring PC cooling into sharper relief. And with a reasonable number of you running systems that kick out considerable wattage, making sure that the CPU or GPU isn't throttling is key to good sustained performance. If you're anything like me then you keep a close eye on how your system is performing, so this edition of the Question of the Week is: how hot does your CPU run? To find out, let's make it a level playing field. 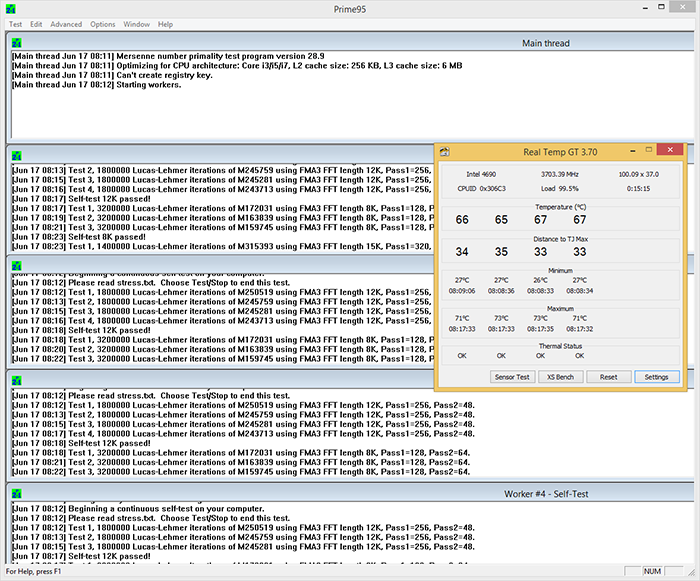 I suggest downloading the correct version of Prime95, using your favourite temperature-monitoring utility - I've used RealTemp though HWMonitor is equally as good - and then running the Small FFT test within the Prime 95 Torture Test for more than five minutes. If nothing else, you will know that the PC is basically stable from a CPU point of view. I'll get the ball rolling with my writing system. Vital specs are Core i5-4690 at stock speeds and voltages, cooling providing by a be quiet! Shadow Rock Slim heatsink inside an NZXT H440 chassis. Quietness is prioritised over performance. Average maximum temperature was reported as 72°C. Let's find out who has the coolest and hottest CPU... and we may award a prize on both counts! So get on stress testing and let us know your average maximum temperature in the comments facility below. My FX 8320 stays cool while having the 100% used. min 27C max 49C after 5 minutes.